Q) I would like to use some of the NPC gimmicks for some of the PCs, but there are no listed costs for these skills. Could you tell me what the cost would be for these? A) Most of the NPC gimmicks are actually the same ones available to PCs, just named differently. For example, the "Pride" gimmick of The American Gladiator is, statistically, the normal Trademarks of "Charisma" and "Guts" simply rolled into one for descriptive purposes. Certainly there are some NPC gimmicks which are unique, but they are few. The reason these unique gimmicks exist is to always allow for at least some challenge to the players. In any game, if the PCs can do everything their enemies can, inevitably, the scales will tip in their favor at all times, and then the game loses its thrill. However, given the fast and loose nature of pro-wrestling (as well as its tendency to recycle popular gimmicks), you can certainly allow PCs to acquire any unique gimmicks that NPCs have. You as Game Referee would just have to carefully judge the cost in Trademark Points. Q) Where can I purchase a copy of this game? A) Just click here Unit (#4001) cost is $20.00 (includes shipping in the USA). Q) How much Reputation does someone receive for winning a battle-royal? A) Winning a normal 20-man battle-royal should merit about 5 Reputation. However, battle-royals are often done in so many different ways, be it the number of participants, the additional methods of elimination, the prize, etc. 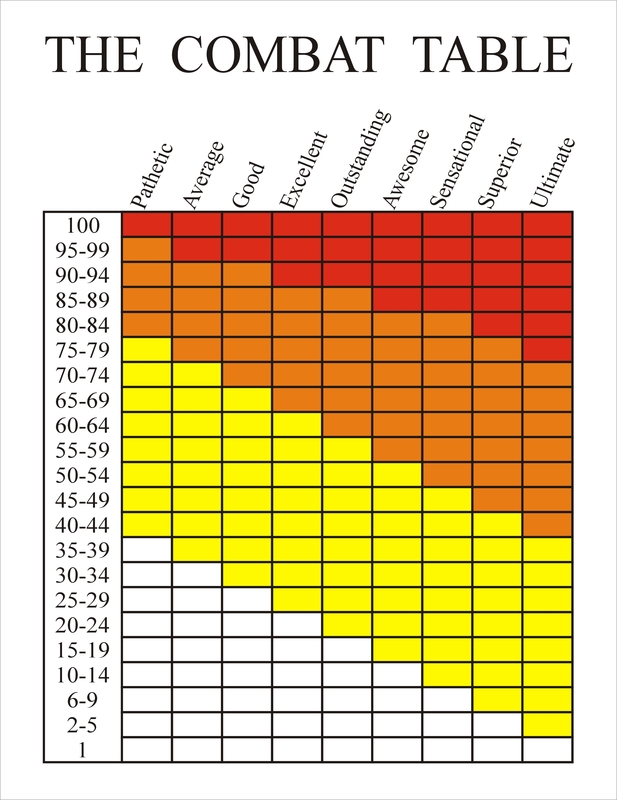 that no standard Reputation award could be put on any chart. It's just too variable. Q) Why are names of (in)famous celebrities that this game parodies, such as 'Tonya' and 'Buttafuco', misspelled? A) So we don't get sued. Q) Where can I get a good Character Sheet for my game? 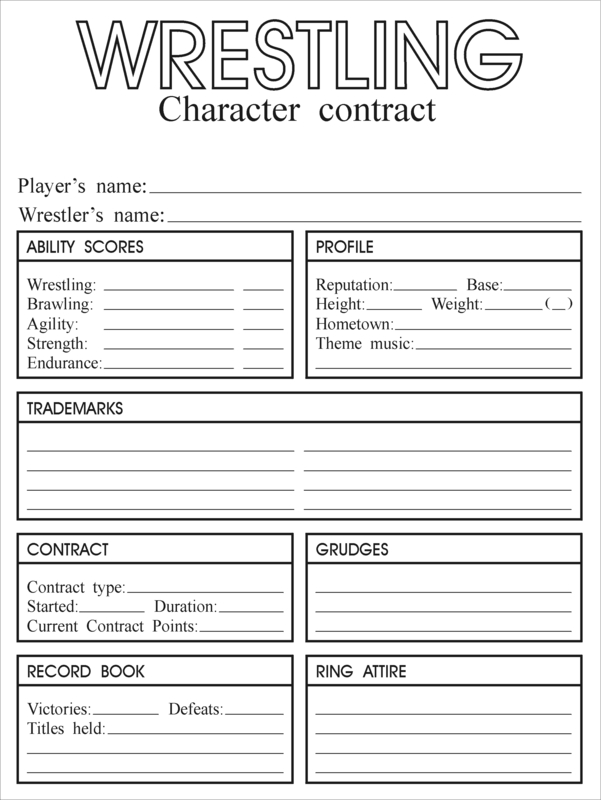 A) The Character Record Sheet is provided in the Rulebook and is free to be photocopied, scanned, or reproduced in any way for use in your own game. However, if you can't quite get the book to lay straight or flat, the Sheet is available in JPEG format here and the Combat Table here. Q) I ran my opponent down with a big blue Caddy. Really, how much damage does an automobile do? A) Well, a car is pretty damn big, but unfortunately it knocks its target aside. Soooo, say 80 Fatigue. Q) My buddy and I were the last two standing in a battle-royal, and then went out and hit the floor at the same time. Who won the match? A) That's the Game Referee's decision. My advice is to have a one-on-one match to settle it. But of course, if the prize for the battle-royal was something they could both have, like a title shot, then they could both have title matches. Q) Isn't the Character of 'the Nazi' a little offending? A) I realize that a fascist isn't exactly PC, but who gives a damn about being PC? I mean, this is wrestling! It's a story of good VS evil, and what better villain, serious or comical, could there be than a Nazi? I think the major wrestling companies for many years have wanted to have such a character, and they've come close, but always had to name him something else. In fact, recently the real-life NWA-TNA had a performer wear a shirt with the ol' 'iron cross' on it, and many people were offended, sending in letters. While I understand their management's position and their apology for that shirt, I must ask, "Isn't a villain supposed to be offensive?" That way you cheer for the heroes all the more! Moreover, those who send complaint letters are usually the noisy-negatives who always complain about too much, rightly or wrongly. Most of the audience didn't write in or complain. Most people on the internet didn't, either. Most people could deal with it. A Nazi isn't offending to me, nor anyone who has playtested this game. The bottom line is that everything is offensive to somebody. You can't walk on eggs and tell good stories. It just can't happen. And besides, this is only entertainment, come on! Why can there be movies about World War II time and time again, and Nazis studied in grammer school, but someone can't play such a villainous fascist in wrestling? The truth is, they can, and I stand by my product's effort to create excitement. Q) How long have you guys at New Dimension Games been watching wrestling? A) Matt deMille, the game's author, has been a wrestling fan for 12 years and counting. Q) How come this game does not use actual wrestling terms? For instance, why say 'Trademark' when the actual term is 'Gimmick'? A) As a longtime fan, the various terms of wrestling are well known to me; Face, Heel, Job, Work, Over, Heat, Booker, etc. However, I feel that wrestling has become TOO real. What makes sports entertainment fun is that it IS sports entertainment! When a commentator calls an attack a 'Run In', it makes the whole thing feel staged. But when he says it's a 'surprise attack', it helps the suspension of disbelief. I'm not 'old school' as it were, but I do believe in maintaining the illusion and not insulting the fans by relying on the insides of the business. Where's the fan in that? Sure, the behind-the-scenes stuff is nice to hear in the context of interviews on talk shows and such, but not night after night during the actual performance. Look at the storylines of today--how many actual CHARACTERS are there? Wrestling can be a lot more colorful, a lot more imaginative, and a lot more entertaining. Maintaining the illusion of it being real is essential to creating excitement.